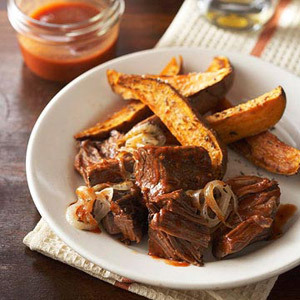 The gravy for this fork-tender brisket is made from a tantalizing blend of beer, chili sauce, brown sugar, and seasonings. Trim fat from meat. If necessary, cut meat to fit into a 3 1/2- to 6-quart slow cooker. In the cooker, combine onion and bay leaf; add meat. In a medium bowl, combine beer, chili sauce, brown sugar, garlic, thyme, salt, and pepper. Pour over meat. Cover and cook on low-heat setting for 10 to 12 hours or high-heat setting for 5 to 6 hours. Using a slotted spoon, transfer meat and onion to a serving platter. Slice meat across the grain; cover and keep warm. Discard bay leaf. For gravy, pour enough of the cooking liquid into a 4-cup glass measuring cup to equal 2 1/2 cups; skim off fat. Discard the remaining cooking liquid. In a medium saucepan, combine cornstarch and the cold water; stir in the 2 1/2 cups cooking liquid. Cook and stir over medium heat until thickened and bubbly. Cook and stir for 2 minutes more. Serve meat and onion with gravy. For easy cleanup: Line your slow cooker with a disposable slow cooker liner. Add ingredients as directed in recipe. Once your brisket is finished cooking, spoon it out of your slow cooker. Once the food is out of your slow cooker liner, simply dispose of the liner. Note: Do not lift or transport the disposable liner with food inside.